I've been meaning to do this post for a month, but haven't been feeling well lately. Sorry for the delay. 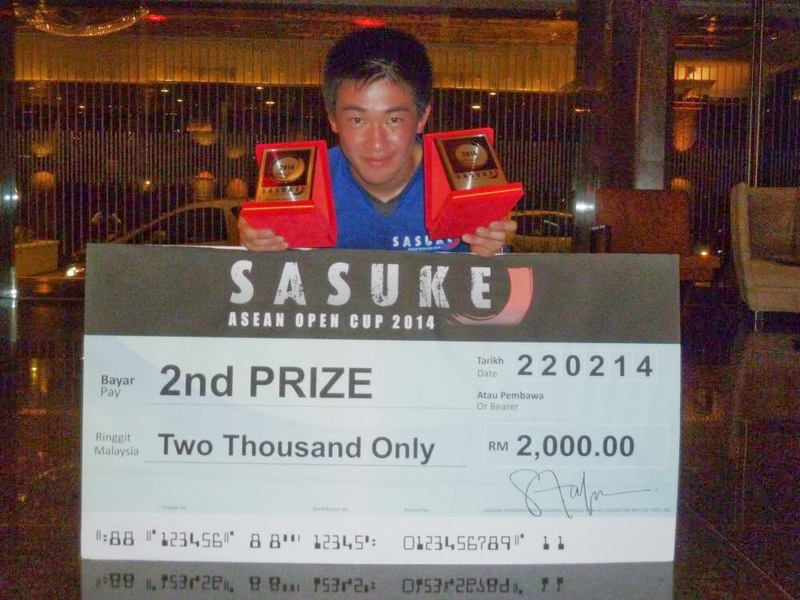 Earlier in March, I had another interview with Yuusuke Morimoto 森本 裕介, who was kind enough to give me a report after the Sasuke ASEAN Open Cup 2014 in Malaysia. If you remember, he also did an interview before the tournament started. I 'm happy he was willing to speak with me again on the subject so soon after his previous interview. Along with his thoughts, I also in my researched ran across the messages written by other members of Team Japan. So, I decided to put them all together in one blog. 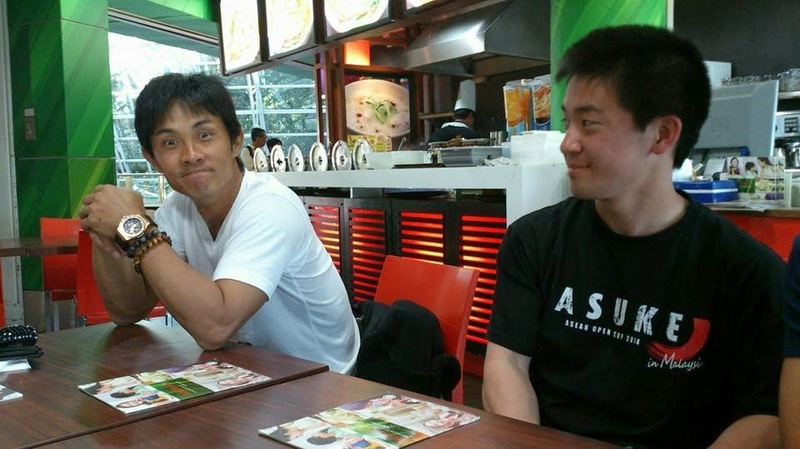 I wanted to do an overall impressions blog that focused on Team Japan. After all, my blog has always been about Sasuke Japan and in particular the Sasuke All-stars. Here we had two of them in the event along with other fan favorites. I couldn't resist. I kept waiting for other reports to come in and then I got distracted, and then sick.. and well that's why the long delay. 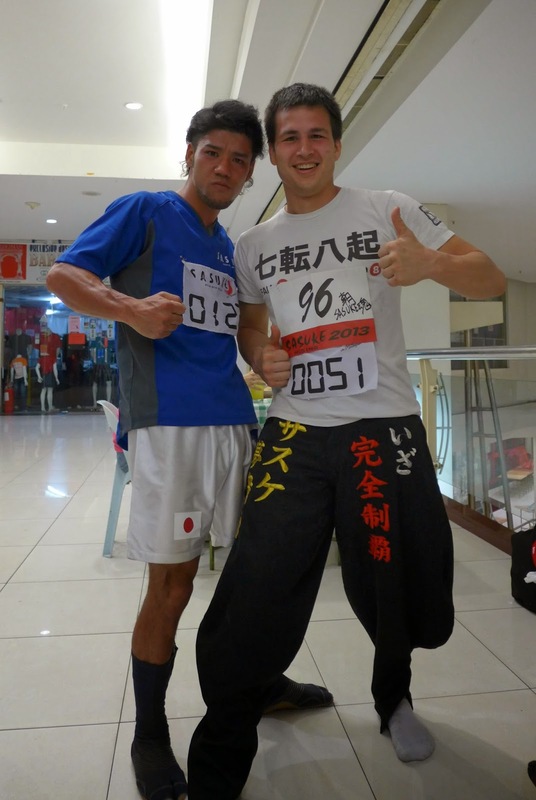 I did however, get a report of a very touching post made by one of the guys from Team Japan. It was unexpected and very moving. Here's what Asa had to say. But I got my phone working again! 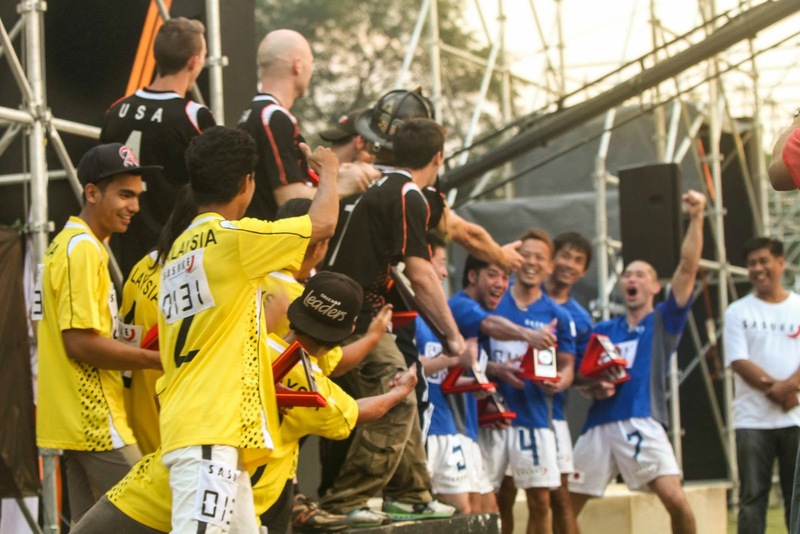 Sasuke Asean Open Cup 2014 has ended and I returned home safely. This was by far the best three days of my life! A huge THANK YOU to the producers, staff, Nagano-san, Matachi, the Japanese team and the participants from around the world. We had such an amazing time. My emotions, oh, my emotions! When I was beginning to lose confidence in myself, Inui-san ran to me and slapped me hard on the back to get me back to life. 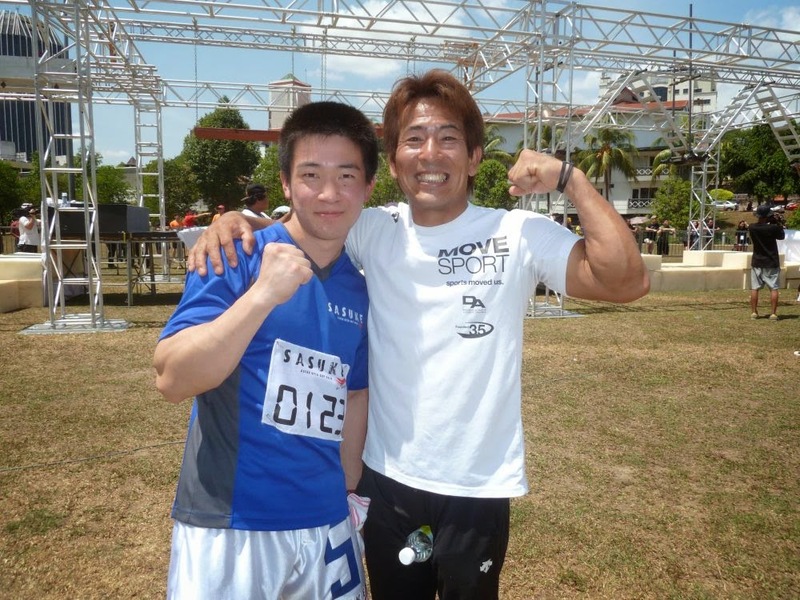 From the time I was selected on the Japan team, Takayama-san fought along with me. And Kikuno-san who cheered on our team until his voice was coarse and was both disappointed and happy about our results. Thank you to Sugiyama-san and Yamamoto-san, and the other members of the TBS team. Then there was Nagano-san who despite having the flu and sweating away like crazy, still slapped everyone to motivate us. And Matachi who came to Malaysia earlier as a tester, who became darker than the locals and gave us advice. Morimoto was the youngest, but he always remained calm and knew what he came here to do. Kanno, with whom I represented Japan twice with (in Las Vegas) was a constant source of support for me. And there was Kong who used his body as a vehicle for jokes and creating such a fun mood for everyone. My last thank you goes to our team captain Yamamoto-san who was such a tremendous leader and showed everyone what the spirit of Sasuke is all about! 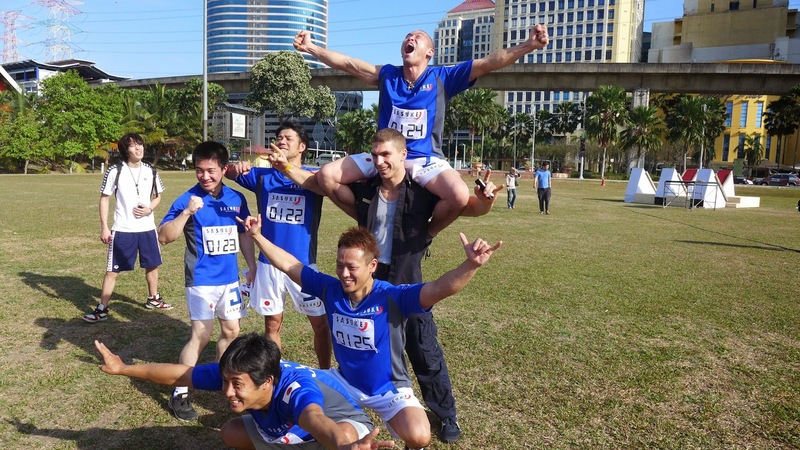 The bond of the Japan team resulted in the silver medal! This silver medal is my treasure! My emotions, oh, my emotions!! My feelings of trying my best will continue!! I want to express my most sincere gratitude to everyone involved in creating this special experience! And to everyone who sent me messages, comments to support me! A Big Thank you to you too!! I will continue trying my best so please continue supporting me!! I was moved by Asa's words (remember that he lost his phone - and no, he never found it. He reported it stolen and had to get another one) given his previous international event (Las Vegas) where the experience was quite.. different (and definitely not as positive). I was moved by the fact that he mentioned, given his age and experience, that this weekend in Malaysia was the best in his life. That's quite a strong statement to make. It's rare to read what he says publicly since he's new to us in the fan-dom (especially Facebook). It was interesting getting his insights. It was also fun to confirm how passionate this guy really is. Even when writing you can FEEL the emotion coming out of him. Morimoto is quite the opposite of Asa in terms of outward emotions. He can talk about Sasuke for hours on end so he's hardly shy. 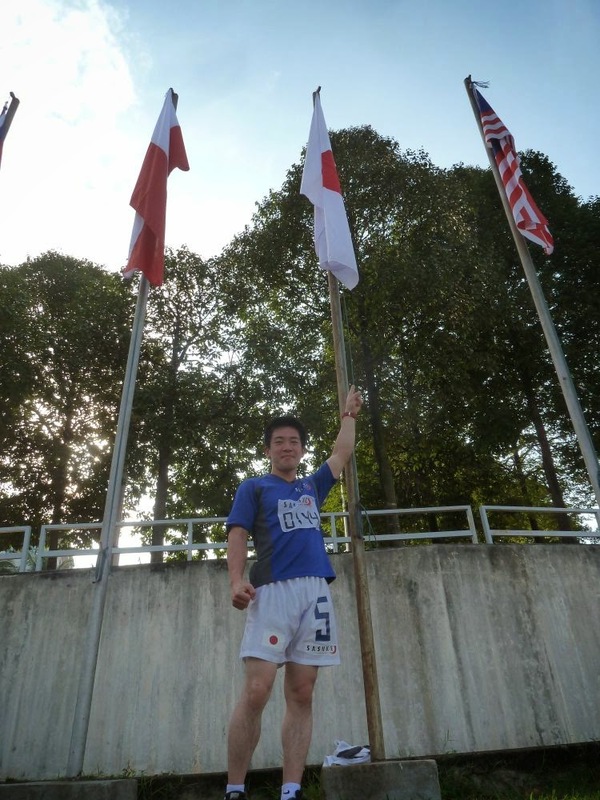 He was so proud to be on that Japan Team. A highlight to actually say he was on an international team and that they actually medaled. He's never left Japan before so this was a trip to remember. I remember talking to Morimoto about the team dynamic. Especially since his polar opposite, Asa was present and competing on the same team. Similar to what we've known about the original Sasuke All-stars, where each person is so different from one another, this group had the same vibe. Given that the team was made up by the results of Sasuke 29, you couldn't put a more different group of people together. Confirming also what I've learned during my interviews, even though Morimoto is the youngest, he's by far the most quiet. He only speaks when he feels he can contribute. He's modest, reserved and truly focused. Could be his country upbringing. Then there was Shingo. He became the de facto team leader. It wasn't anything anyone really did or voted on, it just .. happened. 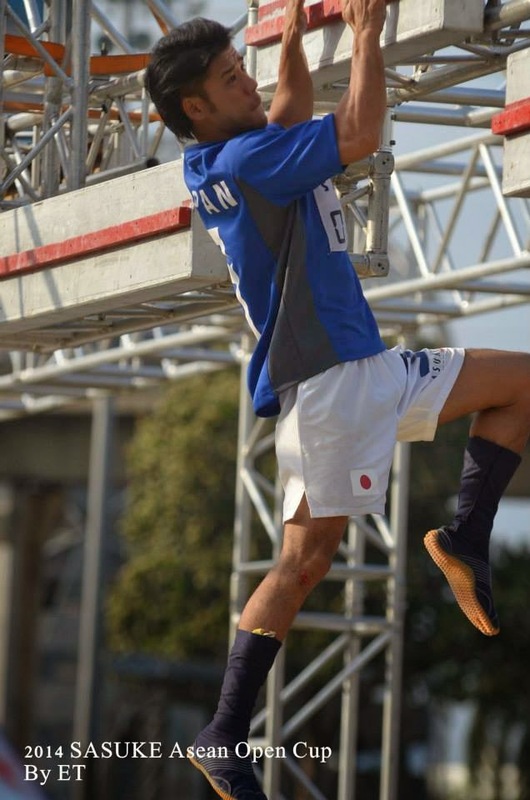 His presence, personality and experience made him the team leader even before the plane left Japan. And besides, just look at him! LOL I'd love to hang out with him! Everyone did take time to say much about Shingo and him being the leader. Again, hard to put into words, but spending time with him was actually a highlight on their trip. Especially when hearing about how sick Nagano was (he had the flu before he left Japan - his son Kaiou first contracted it), it was awe-inspiring to see how open he was with posing for pics and generally mingling. I know fans (and fellow Team Japan members) were so happy to see him be a part of the event. And yes, feel free to laugh at me as I laugh at the placement of that water bottle. Just saying..
And I have a serious message to share. 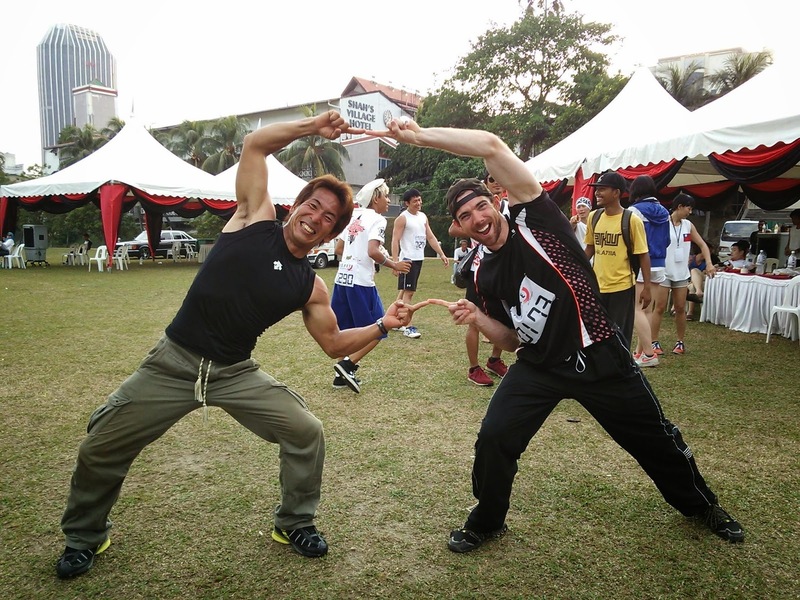 I really want to express my gratitude to the TBS and SASUKE Malaysia organizations for creating the opportunity to turn a television show into an international sports competition. 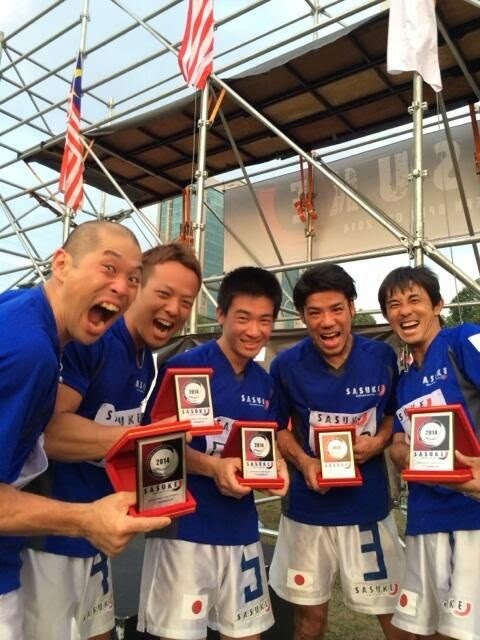 These are the five representatives of Japan at an international sporting competition. Is that not the most amazing thing ever? Oh, and the special guest who spoke in front of honorable representatives at this event was a -- fisherman. In 1997, we created this show with the concept of it being “an Olympic for the unknown athletes.” Indeed, this was exactly what the three days were all about. At the end of the awards ceremony, competitors from seven countries began chanting “Inui, Inui.” I entered their circle of camaraderie. I’m so glad that I worked hard to help create this show. And from today, I’m going to continue working hard. Inui's message was also something unexpected. Since coming back to Sasuke it's been difficult to get the pulse of the current fandom. Especially the foreign delegation. There he had the opportunity to meet the foreign fans up close and personal. He's right that the spirit of Sasuke was present during the small event. 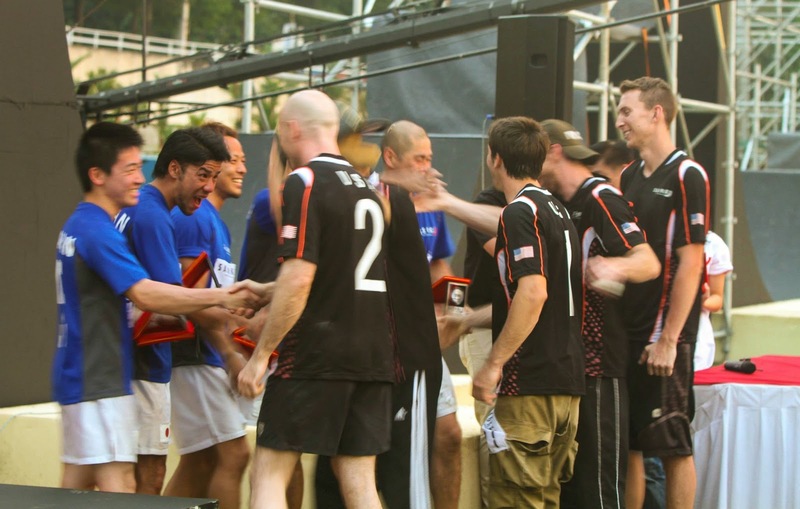 The spirit of camaraderie among people from all walks of life prevailed during the event. They were fans of each other! Always remembering that this isn't a pro event, it's a fan event turning into something bigger. Something different, but with the same spirit behind it. Overall they enjoyed the weekend. Not even because of the results, but because they finally got to mingle with other Sasuke fans around the world. While now I expect the event will become bigger and the differences between Sasuke ASEAN and Sasuke Japan become more apparent, it's really good to take time and enjoy the beginning of it all. A special event where everyone banded together and made the impossible dream happen and finding out that one small family is actually a much larger family in the process. The Sasuke Spirit lives on in a new form while still holding on to what it was that made us love it in the first place. To Yuusuke, thank you for again sharing your photos and insights during this whole process. I thank him for his patience with me while I put together these blogs! I'm happy that he didn't come home empty handed. So color me bias on that front. Thanks also to Asa and Inui for allowing the private Facebook messages to be translated and shared with the worldwide audience. Finally, I thought this was touching. Shingo posted a photo of his wall: various prized photos, a group photo from Sasuke, wedding photos, Sasuke his belated dog and other mementos. 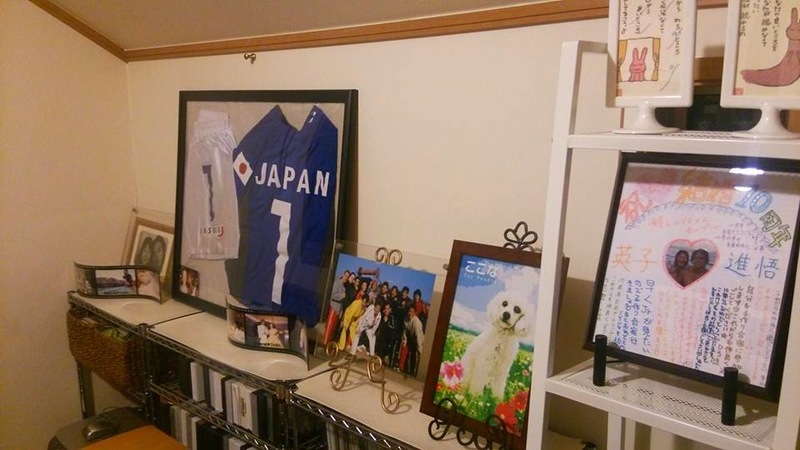 He framed his Team Japan Uniform! I love everything about this, the general up date as well as some of the funny pictures. Thank you! !